Artist, received her bachelor degree of Art in Jilin College of the Arts in 2005. Since 2009, she has been teaching art as a visiting lecturer. In 2009, she initiated Chengdu artistic practice organization “Art Praxis”. Currently living and working in Chengdu, China. 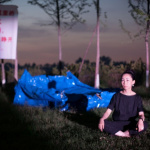 She mainly focuses on “Socially Engaged Art”, and has initiated the collaborative art project Village Politics Being Watched (2010), art-involved project A New Way to Explore Liangshan Village (2012) and planned interaction program Gazing from the Top Floor. Her collaborative art project Village Politics Being Watched has won HUGO BOSS Asia Art Award for Emerging Chinese Artists: 2013 Educational Project “Underconstruction and Reconctruction” and has participated in Transeuropa Festiva in MACRO, Rome and the Bologna's Little Theatre Teatro Si. Her works have been presented in Times Museum (Guangzhou), UCCA (Beijing), OrganHaus (Chongqing), A4 Contemporary Art Center (Chengdu), A Thousand Plateaus Art Space (Chengdu), Sichuan University Art Museum (Chengdu), etc.. Her works’ related comments have been published in Urban China, RTCO Journal, ON | OFF: Collective Practice in China 2002-2012, Leap, etc..